2. Which compounds have low melting point and boiling point? 6. 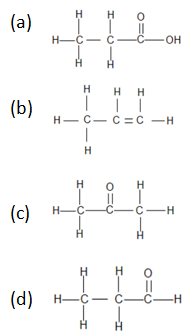 Which of the following is a structure of Propanoic acid? 7. What is the I.U.P.A.C name of acetic acid? 8. Which of the following is a structure of Propanal? 9. What is the I.U.P.A.C name of acetone? 10. What is the I.U.P.A.C name of formaldehyde? Which compounds have low melting point and boiling point? Covalent bond has weak force of attraction, so their bond will be easily break, hence their melting and boiling point are low. 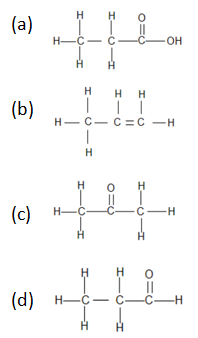 Which of the following is a structure of Propanoic acid ? What is the I.U.P.A.C name of acetic acid? Acetic acid (CH3COOH) contains two carbon and carboxylic group so the I.U.P.A.C name of acetic acid is ethanoic acid. Which of the following is a structure of Propanal? What is the I.U.P.A.C name of acetone? Acetone (CH3COCH3) contains three carbon and one ketone group. So, the I.U.P.A.C name of acetone is propanone. What is the I.U.P.A.C name of formaldehyde? Formaldehyde (HCHO) contains one carbon and aldehyde group. So, their I.U.P.A.C name is methanal.